Texas released its first depth chart on Monday with intrigue still at the running back and right tackle positions. The Longhorns still need to settle on a kicker, too. Either senior Joshua Rowland or freshman Cameron Dicker will be Texas’ kicker in Saturday’s season opener against Maryland. 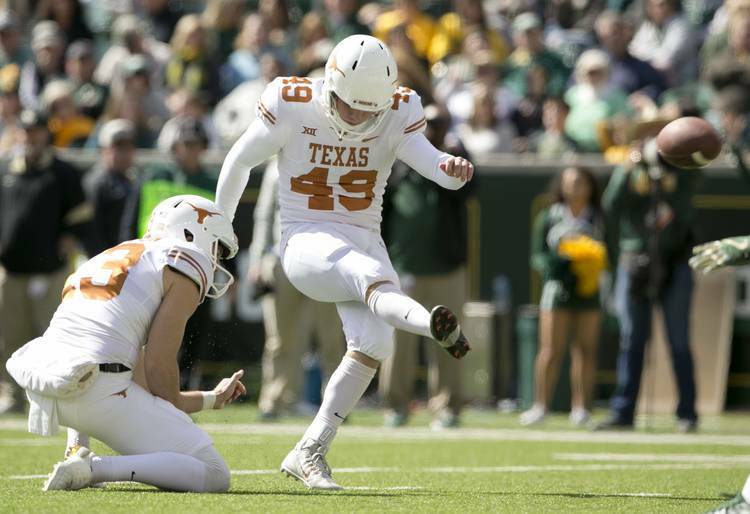 Despite have three former kickers on current NFL rosters, Texas has struggled to find solid footing in its kicking game over the past three seasons. 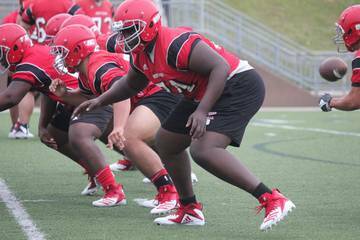 Rowland was a member of Herman’s first recruiting class at Texas, but the Mississippi Gulf Coast Community College product struggled during his first year in Austin. He handled kickoffs and made all of his extra-points, but he missed seven of 18 field goal attempts. Relieved of place-kicking duties at one point during the season, Rowland later won back the job. He and sophomore Chris Naggar were the kickers in UT’s spring scrimmage, in which Rowland hit a 50-yard kick. This summer, the team added Dicker to the roster. One of the class of 2018’s top-rated kickers, Dicker twice earned all-state honors at nearby Lake Travis. New rule: Herman said a new rule for kickoffs was “a step in the right direction,” but still expects there to be collisions on those plays. In April, the NCAA announced an alteration to its kickoff rules. A fair-catch inside the 25-yard-line now will result in a touchback, which would place the ball at the 25. Texas will still ask its coverage team to hustle to the opposing returners in the event of a muffed kick. Herman said UT’s rules for returns will be based on the game plan, but balls will likely be fair-caught inside the 5-yard-line if Texas is facing an elite cover unit. If the opponent’s coverage unit is average, those decisions could be left to the Longhorn handling the kick. As for who will return kicks, six players are listed — wide receivers Lil’Jordan Humphrey and Devin Duvernay, running backs Daniel Young and Kyle Porter, and freshman defensive backs D’Shawn Jamison and B.J. Foster. Senior cornerback Kris Boyd, who was not listed among those candidates, actually led UT with his seven kickoff returns in 2017. Porter averaged 25.3 yards over six returns. Different routine: Texas and Maryland will play at FedEx Field, home of the Washington Redskins, and the Longhorns will participate in a walk-through practice there on Friday. Normally the team does its walk-through for road games at home before it gets on the plane. The change in routine will allow the players to marvel at the professional venue ahead of time. The Longhorns also will have an opportunity to adjust to the different landmarks of the stadium, which Herman says has different hashmarks and numbers than a college field. Backup plan: Not surprisingly, senior linebacker Anthony Wheeler was listed as the first-string middle linebacker. Wheeler, though, will be unavailable for the first half Saturday; he was ejected from the Texas Bowl with a targeting penalty, so he must serve a one-half suspension. Junior Jeffrey McCulloch is listed as Wheeler’s backup on the depth chart. McCulloch has been working through a pectoral injury this fall camp.